If we aren’t careful, we can chase after it, day in and day out, as if it is some end point. 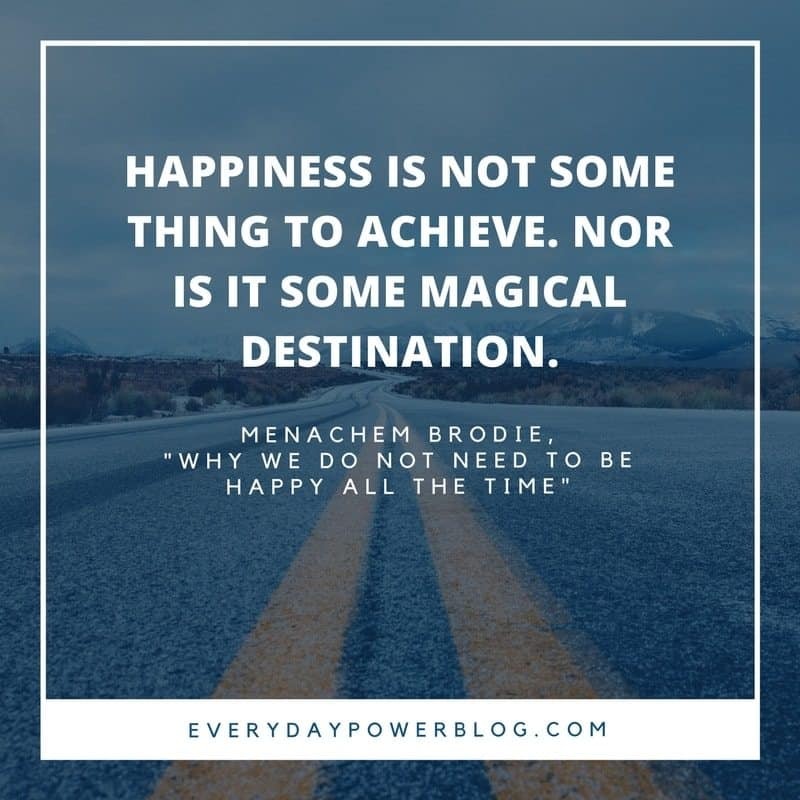 Happiness is not some THING to achieve. Nor is it some magical destination. Happiness is a part of our journey in life. It is a state of mind, a state of being that one must seek to attain, maintain, and accomplish. Yoga masters have spent lifetimes seeking it. Buddhists spend hundreds of hours trying to attain it. Addicts and drug users seek short-term artificial bursts of it (which ultimately destroys the pure, true form or happiness). So, we should be happy all the time, right? Not necessarily – and here is why. Throughout our lives, we will have good times and bad times. Times of joy and times of pain. Such is the way of life. But this balance of pleasure and pain is one of the primary drivers of our lives. It’s what allows us to become who we are, for better or worse. But staying in one state can actually throw us out of balance, or knock us off track. We need to have a little turbulence here and there in order to allow us to truly relish and make the most out of the good times. What does this mean? That we should be miserable or unhappy some of the time? No. It does mean that while life can knock us off balance every now and then (with seemingly bad events occurring in our life), we must be able to return to a positive disposition quickly, and more powerfully. We shouldn’t be happy all the time, because there are a variety of other positive emotions that, when used properly, will allow us to strengthen our positive outlook. When all these emotions are utilized in our daily lives, they allow us to experience a whole new level of enjoyment – and yes happiness. It’s a matter of how we interpret the MEANING of events that occur in our lives, as well as the attitudes we carry throughout each and every day. 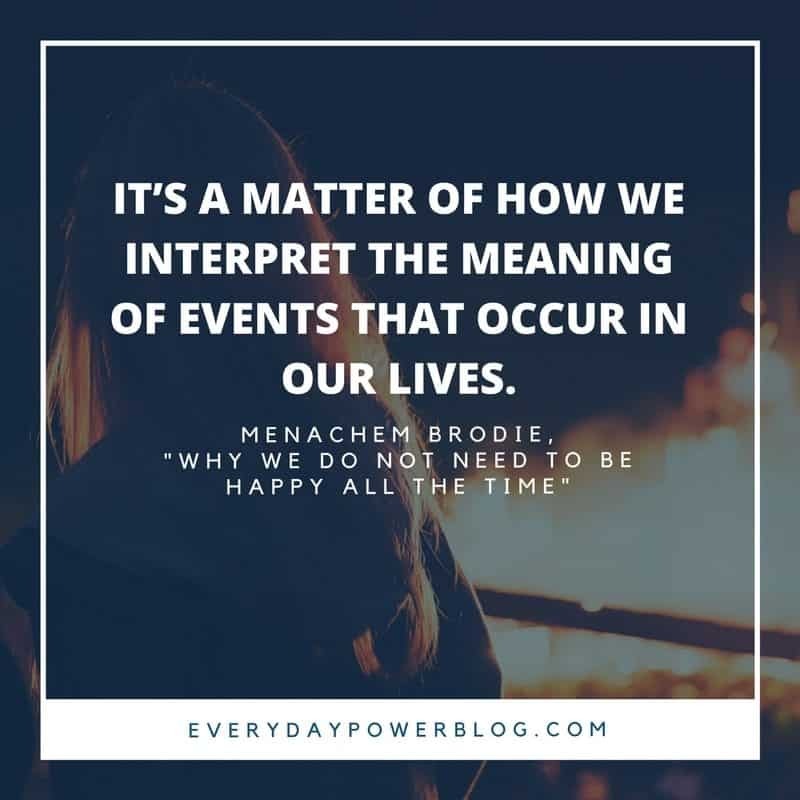 THAT is what we must seek after – not happiness itself, but the ability to give a positive meaning to events in our lives, and how we will use the energy created by said events. If you aren’t carrying a positive/happy disposition at this moment, here are some emotions and virtues that will help you move away from the negative towards the more positive, no matter what life throws at you. While they aren’t necessarily the same as being “happy”, they strike a similar chord. Perhaps one of the most under-expressed emotions in the modern day is that of gratitude. This is an incredible starting point if you’re just beginning on your quest towards happiness. Gratitude, when practiced in its whole and unadulterated fashion, allows one to experience the world through a lens of abundance, like none other. Think about the incredible things one has at their disposal in today’ s modern world: A computer, with which you can read this article, or to access nearly any other piece of information you like, to a degree that we have never before had. Your health, which many of us will take for granted until we are ill or injured. Walking is another huge blessing in itself; as is seeing, smelling, feeling, and smiling, as well not being stuck in a bed/on crutches/in a wheelchair. 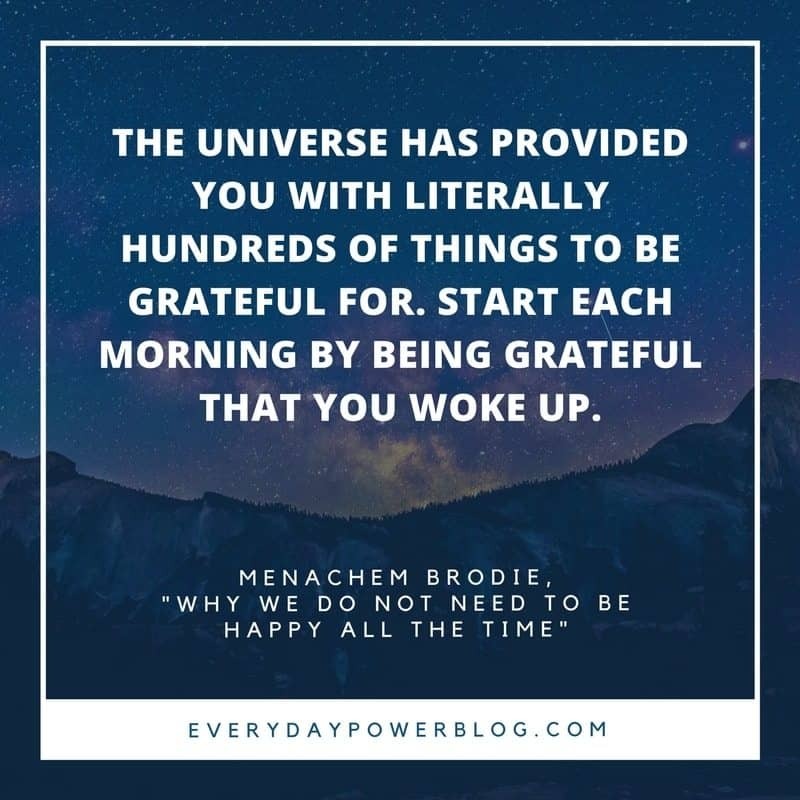 The universe has provided you with literally hundreds of things to be grateful for. Start each morning by being grateful that you woke up, that you have your sight, and that you can get out there to put your skills to use for the world to experience. Be grateful for your successes and failures, as this is how you learn where and how to apply your skills. If one puts forth the emotion and energies of abundance – and gratitude for it – the universe will work to reward you with abundance…before you know it, you’ll begin to feel small spurts of JOY. While a close relative to happiness, joy is when something or someone in our world creates a huge burst of happiness at once. But it takes determination and boldness to practice gratitude frequently and consistently enough to have more JOY in your life. As you begin to experience small bits of joy throughout your daily life, it will build momentum and strength. Gratitude and joy can work together to create a foundation for happiness, and to allow you to sail your boat through the vast majority of storms that life – and the universe – may throw at you. This is where we begin to stand as sentinels using our own eyes and ears, vigilantly seeking the good in things we see, hear, and speak. Listening to music that lights up your soul for example, can literally pull you out from despair and sickness. Just look at this wonderful video clip that has gone viral on Facebook recently! If you’re not so musically inclined, but more artistically inclined, painting, drawing, ceramics, and so many more arts also allow us to connect and express the joy we hold within us. These arts are expressions of our raw soul, that which lifts us, and allows us to access our own “inner genius”. To be patient and tranquil no matter what happens in your day to day life, is perhaps the highest level of happiness one can attain. Why? Because to have the absolute unshakable faith that everything that happens to you is for your ultimate good, is the hardest and most challenging thing there is in life. I do not say this lightly. While I still have a bit more to travel on my road to success, I am not far removed from some of the absolutely most trying days of my life and career… and I’ve seen it with the athletes whom I coach, and the businesses that I’ve worked with as a consultant. 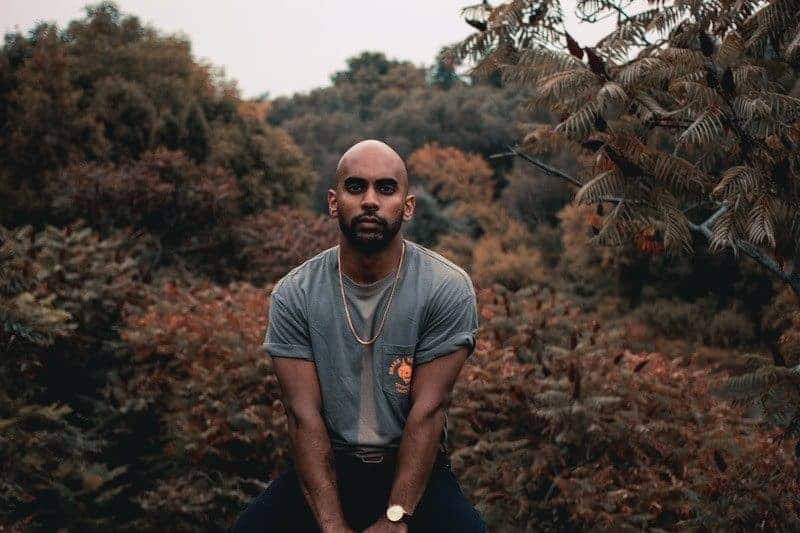 As soon we become focused and start hustling toward our PURPOSE in life, towards our DREAM, we suddenly encounter hardship, obstacles, and obstructions in what seems like every shape and form, and from nearly every single direction. But, my friend, the OBSTACLE IS THE WAY (this is a great book as well). These are the times when we can truly experience JOY, as we work harder, hustle harder and smarter, and focus on an attitude of gratitude in spite of these obstacles. As we turn that suffering and despair into pure happiness that is far greater than we would have had, we realize that we would not have learned what we are TRULY capable of, were it not for that obstruction on the way to our dream. You don’t need to be happy all the time. The key here is patience, with a grateful attitude, which allows us to be filled with positive energy – not negativity. THIS is where you go from someone who is SEEKING success and happiness, to one who IS Success-FULL and happy. Our world today is filled with those who are depressed, angry, and sad. It seems at times that our society is supporting this downtrodden thinking by constantly pushing in front of us the bad and horrible things that have happened at every hour. “The news” is constantly the negative things that have occurred, while the many good things are lost upon us, seemingly buried under the bad of the world. Finding true joy and happiness is the hardest thing to do, especially in today’s world. It seems as though one must literally force oneself to be happy all the time. But as see, happiness begins by enacting an attitude of gratitude to everything and everyone around you, and being patient through life’s trials and storms. By combining gratitude and patience together, this will allow joy to form in small spurts, and then in greater and greater abundance. Or put it more simply: sometimes in order to feel happiness, you need to experience some pain. But don’t allow it to jade you, as true happiness is pure and unadulterated.